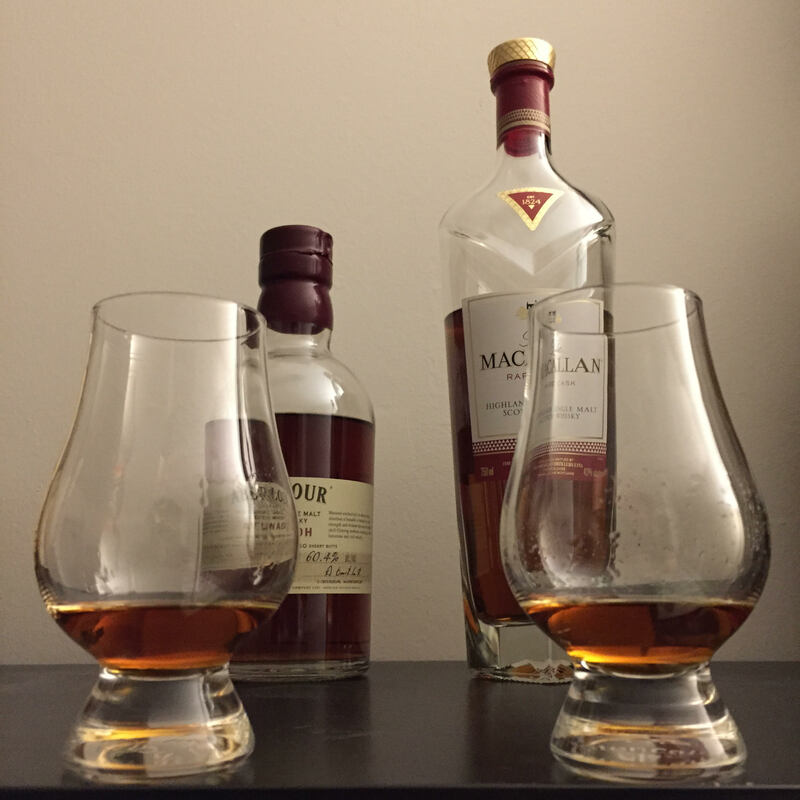 We’re comparing a $90 cask strength Aberlour to a $300 macallan. Is there a $210 difference in these bottles? Let me just say off the bat, the packaging, bottle, and bottle topper for the rare cask are worth the first hundred dollars. The bottle is beautifully cut and angled with feminine shoulders donning a low necked top. The topper is one solid piece of metal with a checkered pattern holding the cork. The packaging is magnetically held closed and wonderfully compliments the bottle. So with that very expensive but effective marketing aside, the bottles don’t compare in the presentation category. Considering the Rare Cask from Macallan and the A’bunadh from Aberlour are both aged in magical Sherry casks, it’s no surprise that their noses are similar but the Abunadh immediately stands out… as its almost-20%-higher-alcohol-content train wrecks it’s way into your nostrils. The Rare Cask reeks of sherry and sweetened vanilla and more… The Abunadh is much more of a sherry with mouth watering orange marmalade and classic sun dried raisins. So though they both scream Sherry, they both have pretty obvious differences in the nose. The Abunadh at full strength is tannic and heavy handed. Holding it for a while on the tongue may be more dangerous than helpful to analyzing the flavors in the juice. The raisins reappear and pepper finds its way to the middle of the tongue. The alcohol is overwhelming though. Considering cask strengths like this (60%) can be cut in half, you’ve essentially bought two bottles of tastiness. That alone doubles the value of the Abunadh! So it’s really a $180 bottle vs a $300 bottle now! Minus the Rare Cask packaging, this has quickly become a fair fight!! The Rare Cask is much more kind to the palate… soft sherry gives rise to spices and pepper. They’re forward but not overwhelming. And now we add water! The Rare Cask was already mellow and the dilution only brings a touch of sweetness to the forefront but it’s still very much a spicy sherry bomb. Macallan knows their fans very well. The A’bunadh isn’t any less tannic. It rushes to pull the water from your mouth but hold out for the sugar and spice of the Sherry. It might be the side by side reviews of two sherry bombs that’s hurting my objective… I’m betting on that… or the A’bunadh really did just shed its sugar. The Rare Cask is only slightly oily and lingers like sweet sugar cooking over a fire. A hint of caramelized sugar with a touch of smoke. Burnt sugar edges if you’ve ever had sugar fried into a pancake (like they do on the streets in Korea). The A’bunadh’s finish is manageable and not nearly as lingering. Surprising. So how do they compare? The Macallan finds sugar and the A’bunadh finds spice. They both find sherry and they both taste amazing! They’re both worth their cost but the A’bunadh makes a great substitute for the Rare Cask as long as you’re not hunting for that extra sugary sweet over smoke over sherry.